Season 4 of Castle, doesn’t time fly. It actually feels like I’ve sent considerably more time with these characters than just four seasons. I mean that in a good way, the characters feel like people that I’ve known for years, maturing and adapting and going through life’s little tribulations (attempted murder, explosions, epic betrayal, you know the day to day stuff). 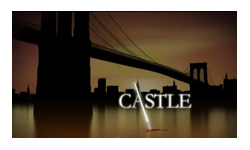 Castle sits alongside shows like Bones which are happy and comfortable in their place at the somewhat sillier end of the procedural spectrum. They don’t take themselves too seriously and usually focus on quirky cases rather than angst ridden investigations into the darkest crimes. I guess it’s actually pretty concerning to be treating murders as ‘fun’ just because the victims and suspects were involved in zombie walks or reality dance shows, but we’ve got to get our entertainment somewhere. There’s also usually just about enough emotional response to make you not feel like a complete monster. The show is of course carried by Nathan Fillion, he’s the reason I started watching and his character continues to be one of the best out there, a perfect blend of irritation and charm, capable of bouncing between child-like enthusiasm and grown-up intelligence and honesty. Increasingly though I realise what a fine job Stana Katic is doing as his partner. She lets just enough humour shine through that she’s not ‘just’ the straight man and her balance of fondness and irritation with Castle is adorable. Maybe Bones’ success at creating a believable and actually rather lovely relationship between it’s two main characters has weakened me, but when Castle and Beckett eventually stopped dancing around each other at the end of the season, I wasn’t annoyed. I actually find myself really intrigued to see what happens next season without any of the sense of dread I would have had in the past. I do wish they’d do a little more with the other supporting characters. Alexis was the only one who really got any sort of arc this year, and it was very well written and acted. Watching her go through her last year of school and struggle to decide where to go to college, torn between reluctance to leave home and excitement at the possibilities ahead was sweet and interesting, particularly when combined with watching Castle correspondingly struggle with pride and ambition for her, but sadness that she’s growing up. Their relationship is beautifully played out and right up there with Veronica and Keith Mars on the wonderful father-daughter relationship rankings. It’s a shame the other supporting characters don’t really get much to do. Ryan and Esposito are always entertaining, their easy going and very well established partnership a good contrast to Castle and Becket who continually question their partnership. But I’d like to see Ryan and Esposito do a little bit more than just the grunt work and exposition delivery. As everything came together for Beckett and Castle at the end of the season, it seemed to be breaking apart for Ryan and Esposito and I really hope that the fallout of that is given some good screen time next season. Like Bones and NCIS Los Angeles, this show knows what it is and plays to its strengths, focussing on what the audience loves – the charismatic actors, geeky storylines, and bucket loads of fun banter. The episodes that I find least interesting are actually the ones with the biggest plots, the two parter in the middle of the season with a whole conspiracy theory and national threat thing going on I just found rather tedious. It’s an easy going show, comfortable to settle in with over dinner at the end of a long day.